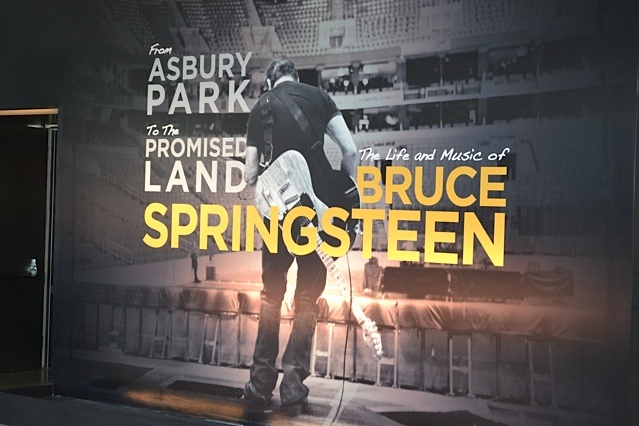 Currently on display at the National Constitution Center in Philadelphia is From Asbury Park to the Promised Land: The Life and Music of Bruce Springsteen, a transport of the celebrated collection from the Rock and Roll Hall of Fame and Museum. The exhibition is running through September 3. 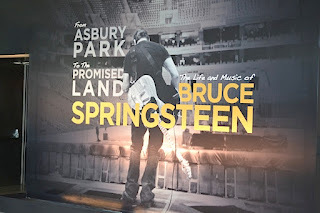 The Legends of Springsteen gang took a road trip out to the city of brotherly love this past weekend and got to experience the magic firsthand. It was worth every mile we drove. 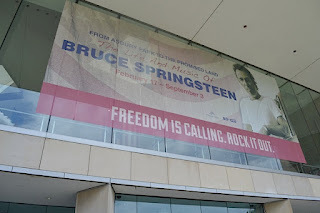 Chronicling Bruce's rock 'n roll career from his days as a teenager in a garage band through near-present day, the exhibit is a treasure trove of memorabilia for Bruce fanatics. While it may not offer a wealth of surprises for the most devoted fans, it offers complete and utter immersion in Boss-mania. 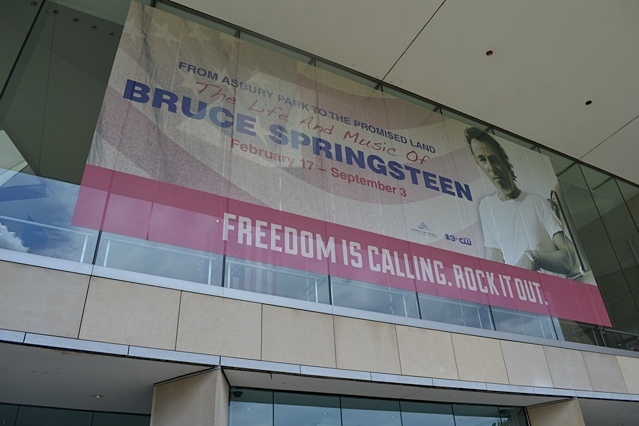 The biggest surprises are likely found when you first enter the exhibit and are face with the teenage Springsteen, a floppy-haired Flower Child who played in bands like Dr. Zoom and the Sonic Boom and sported psychedelic attire. In addition to the photos and promotional posters, a listening station offers never-released tracks from The Castiles, Bruce's high school band. An original song called "That's What You Get For Loving Me" is a peppy tune with traces of Bob Dylan and The Everly Brothers that is almost worth the price of admission alone. You can also hear covers of "Purple Haze" and "Eleanor Rigby", but those are better left in your imagination. In terms of memorabilia, there is a large variety of his outfits with everything from funky '70s garb to the t-shirt, jeans, and cap he wore for his Born in the U.S.A. album cover shoot. Vehicular enthusiasts will delight in seeing Bruce's 1960 Chevy Corvette that he bought after Born to Run and the Harley-Davidson he rode across the Southwest following the Tunnel of Love tour. Truthfully, neither of them appealed to me as much as seeing his Oscar for "Streets of Philadelphia". A few of the quirkier knick-knacks on display include an award from Blistex for the "Boss-est Lips" and an OJ-styled carton of "Bruce Juice" - a promotional item from a radio station. Both of these pieces illustrate the degree to which Bruce saturated pop culture in the late '80s. Scattered throughout the exhibit is an overwhelming number of notebook pages containing Bruce's handwritten lyrics. Along with the chance to inspect his penmanship (which was beautiful in my opinion), you can see his scribbles and cross-outs. Scouring these pages will reveal a few fun nuggets, like alternate opening lyrics to "For You". There's also something deeply personal about seeing Bruce's handwriting that makes the lyrics resonate all the more profoundly; reading the lyrics to "Walk Like a Man" almost brought me to tears. Also on display is the small table at which Bruce wrote the majority of his early songs. I'd always envisioned Bruce sitting on a rocking chair with his feet propped up on a windowsill doing his writing, but the shabby, circular table is characteristically pedestrian. 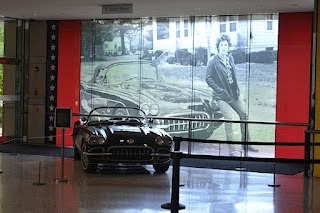 For the passing fan, the exhibit offers a number of engaging access points such as video monitors with interviews and performances, blown-up posters showcasing lyrics to his most popular songs, and a PostSecret-esque wall inviting visitors to contribute a post-it with the song that means the most to them. I left my mark with "Happy". The exhibition's layout is its only weakness. After stepping into Bruce's early days, the rest of the exhibit adheres less to chronology and more to thematic groupings of objects, which comes off as a bit scatter-shot. The gift shop also leaves much to be desired. All three Legends of Springsteen editors were ready to waste some serious cash but with a limited selection of overpriced coasters and mugs, we had to settle with matching magnets. But these are both minor quibbles. 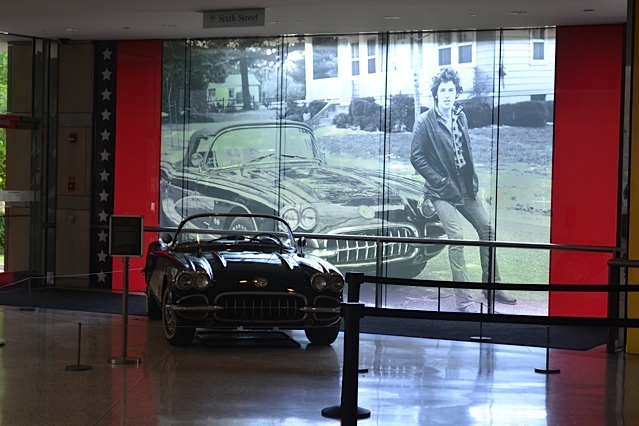 We strongly recommend anyone within driving distance of Philadelphia to make a visit to this shrine to Springsteen as soon as possible. Springsteen Lyrics Of The Week- "Thunder Road"